Tickets Selling VERY Fast - Buy Now - see you & your friends there! Be sure to "Like" & "Share" above to help spread the word!! The Philadelphia area is home to some of the best breweries in the nation. Some are really well known, other phenomenal brewers are just beginning to make their mark. MGK has teamed up with Independence Seaport Museum to bring Pennsylvania’s, New Jersey's & Delaware's finest breweries into one place to celebrate this tremendous bounty of brew. Introducing MGK's 3rd Annual Locals Only Beer Fest. Soak up awesome views of the Delaware River on the Museum's tented 4th floor observation deck while sampling 50 varieties of beer from 25 of the area's best brewers (see full list below). To expedite the entry process, we will begin check-in at 12:15p. You will not be able to consume beer until 1p, but you will be allowed into the event space to enjoy the music & awesome views. Each brewer will offer up their flagship beer (a beer they are most known for), as well as a specialty beer (a new or rare beer). Attendees will get to vote for their favorite in each category. The winning brewery in each category gets a free $5k commercial schedule or free live broadcast from MGK. Attendees get free admission to tour the museum with their Beer Fest ticket + the station will have plenty of chances to win free prizes throughout the event. You can't tour the musuem once you've consumed alcohol but you can use your free museum ticket/voucher up until 12/31/19. It’s not an MGK event without great music, so the MGK DJs will be providing the tunes. John DeBella, Debbi Calton, and Andre Gardner will each play an hour long set from their personal collection. Each brewery will present at least 2 varieties of beer - a flagship beer and a new/specialty/rarity beer. Broken Goblet, Conshohocken Brewing, Crooked Eye, Crowded Castle Brewing Company, Double Nickel, Elvil Genius Beer Company, Flying Fish, Great Barn Brewery, Iron Hill Brewery, Levante Brewing Company, Mainstay Independent Brewing, Moss Mill Brewing Company, Naked Brewing Company, Neshaminy Creek Brewing Company, Philadelphia Brewing Company, River Horse, Ship Bottom, Sly Fox, Saint Benjamin Brewing Company, Troegs, Twin Lakes, Victory, Weyerbacher, Yards, Yuengling. Check out photos from last year's Locals Only Beer Fest & photos from previous MGK beer fests. All patrons entering the MGK Locals Only Beer Fest even space must be 21 years or older, including Designated Drivers. Independence Seaport Museum is located on Philadelphia's Penn's Landing waterfront. Patco: The 15th/16th Street station is a short cab ride away. Parking is available in the Hilton Penn's Landing Parking Garage, located next to Independence Seaport Museum on Columbus Blvd. On-street metered parking is available on Front Street and the surrounding area. If you park at the Hilton parking garage next to the Museum, you may receive discounted parking if you obtain a discounted parking ticket on your way out of the beer fest (while supplies last). Once the discounted tickets have been used, we won't have any additional available. The parking garage structure houses the Hilton parking lot, the outdoor parking across from the Hilton is not affiliated with the Hilton and does not offer discounted parking. We will have staffers stationed in and around the exits on the 4th floor area of the Museum from 3p-5p to hand you a parking ticket should you need one. View More Events Organized by 102.9 WMGK. 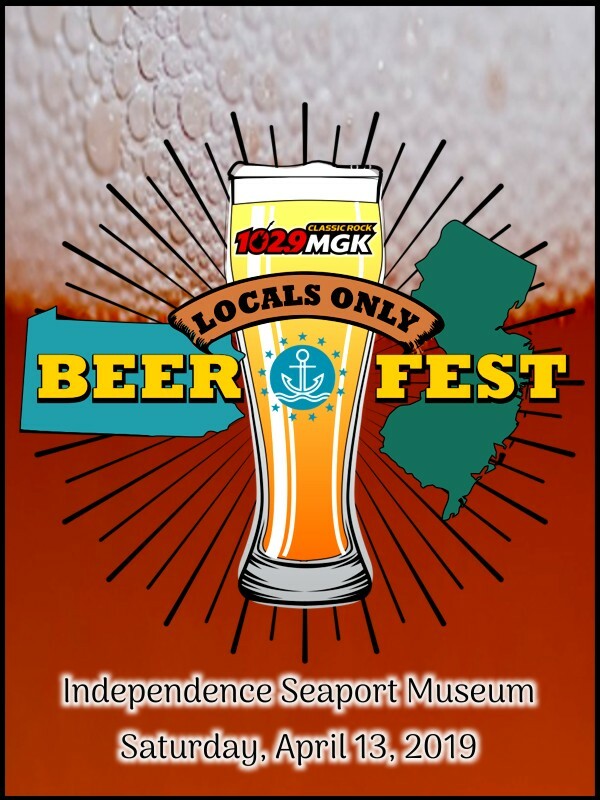 Join the MGK air staff for a great day of craft beer sampling from 25 of PA's and NJ's finest brewers at Independence Seaport Museum . This event is organized by 102.9 WMGK.